Showing results for tags 'leia'. This week's custom is a Death Star Escape Diorama by Hemble Creations "Death Star Escape. Recipe Figures - are all from Hasbro's BS 6" line and have had the joints glued and covered and they were painted using Vallejo Paints. The E-11 blasters are from Bandai's Stormtrooper kit as I think the look more to scale. Base - is foam board as are the walls and the DS walls I have printed and resized off the net and attached them to the foam board. The floor was done by firstly spraying it with matt black and then I used clear contact to give it the shiny look. The blue and black containers from https://www.facebook.com/outerrimtraders/. The bottle looking canisters are old asthma sprays and the vent's near Luke and Leia are the asthma spray holder. The whole base has been glued to a electric turntable so that it can placed into a corner and still be able to see the whole diorama. 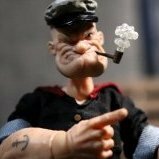 [See video @ above link] Check out the image(s) of their custom below in our GALLERY! Click here if you would like to submit your own custom figure(s) to be displayed on JediInsider.com, and be sure to check out our Custom Forum section, where you can discuss and show off your work among other customizers. This is a new segment we are launching here on JediInsider where we spotlight awesome Toy Photography from some of the hottest photographers on the Internet today. For today's photo we are spotlighting Photographer Shooting The Galaxy Resistance Briefing By Shooting The Galaxy Be sure to Give Shooting The Galaxy a follow on Instagram and let him know what you think of his work in the comments below.